Zindagi Tv Indian Premium Tv Channel is releasing new shows in the Month of October. 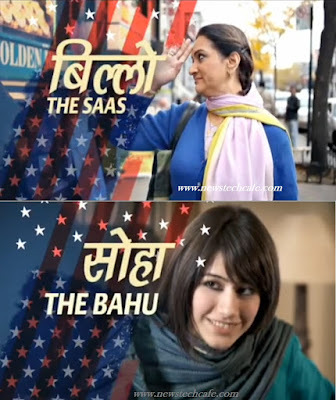 'Saas Bahu Face-Off - Bilqees Kaur' is an Upcoming Tv serial which is going to be start from October 2015. This Upcoming Tv Show Story is written by Faiza Iftikhar and this show is directed by Adnan Ahmad . The show is produced by Momina Duraid . In Pakistan,this Tv serial was same named as Bilqees Kaur and aired on Hum tv. Bushra Ansari & Ahsan Khan playing lead role in this show and this serial is one of the most popular Tv Shows in Pakistan. Bilqees Kaur is the story of Balwant Kaur and Iqbal Bhatti, a Pakistani-origin couple with a conservative lifestyle that has been living in New York for 30 years. To maintain their traditional ways, the couple gets their son and daughter married into Pakistani families. However, the younger son, Sultan, thinks differently and chooses the bold and confident Soha as his wife. Maha Warsi as Elizabeth "Liz"
Promo of the Show Saas Bahu Face-Off - Bilqees Kaur is available .